This is a very exciting post, because it has pictures! Hurrah! Granted, the pictures aren't related to current knitting projects, but the pictures are knitting related! The first one is my "finished" Glaistig. I was supposed to knit a band, but I got bored, so I used a sparkly ribbon instead. Everyone has complimented it, but I feel it is a bit strange, but I think I carry it off well. 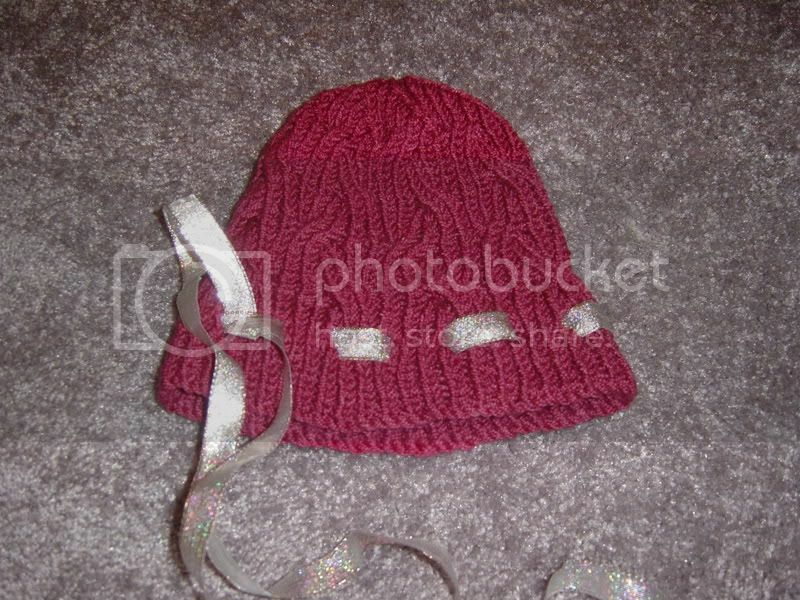 :) The only problem I have with the hat is that it is either too short or I knit it too tightly, because it tends to ride up and create a bit of a point on the top of my head. I also keep my hair in a bun and have large earphones, which might be causing part of the dilemma as well. 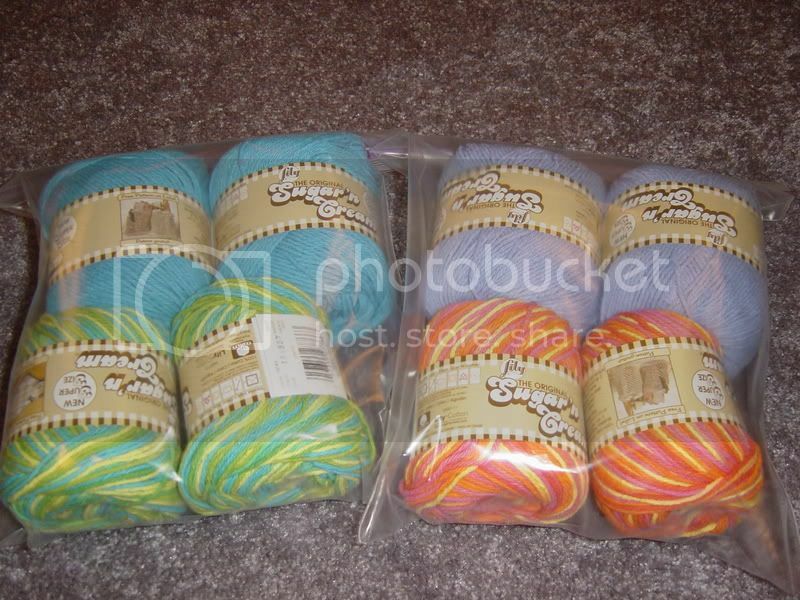 The second picture is of the wonderful $1.50 balls of yarn! Remember I told you about my amazing deal! All of that yarn for $12 (plus tax)! No dinky balls of yarn for me (3oz each)! No siree! In other news, Gainesville is not the place for allergies. For the past week, I have been out of commission. My doctor suggested I switch allergy meds, and, boy, was that a bad idea, because I literally spent the entire weekend in bed. The stuff zonked me out, so alas I am back on my old stuff that doesn't work as well, but at least I am awake. Oh! Another amusing story is that this is the first time that I bought sudafed since it went behind the pharmacist's counter (people use it to make crystal meth and whatnot). I sounded like the most suspicious person! I am sure I am now on all sorts of FBI lists. Here are just some of the perfectly reasonable yet highly suspicious questions I asked the pharmacist, (while the guy is typing my info into the computer) "So is my information in all of the Walmarts in the area or do you need to insert my information into each Walmart individually?" and my favorite, "How often can I come back and buy more sudafed?" My friend told me it would have been worse if I had been buying other crystal meth ingredients, so I guess the potato chips and socks were a good cover. :) BTW, I am really curious to see what google searches pop up for this blog now! In far more entertaining news, I am going back to Disney World in March. I have decided the only thing that is going to keep me sane in grad school is a trip to the happiest place on earth as often as I can. In January I went with my friend K who was a Disney virgin; the trip was great since I got to see him experience the "magic." This time I am going with my parents who are old school Disney folks, so the experience will be entirely different. I know there are people out there who think it is totally commercialistic and expensive, and I totally agree, but even during the few bad experiences I have had at Disney, I never feel more relaxed or happier than when I am there. Life just seems so full of possibilities there. I just love watching the parades, fireworks, and the little kids meeting their favorite characters for the first time and really believing that they are meeting Mickey, Minnie, and Donald. Dreams can come true! Yes, I am already planning on writing my Master's at Epcot, probably at a cafe in "France." BTW, did you see my wonderful Harry Potter clock? Yea! The excitement! I cannot even begin to contain it. Oh my! I need to start rereading the first six books! Hi, nice hat! I think the ribbon goes very well with it. Could you stretch it out by blocking it? The search term thing is very amusing...I've had several people reach my blog when their Google search turns up a photo whose label, I admit, could be misleading.